Blue bags collect trash on the side of Carefree Highway. 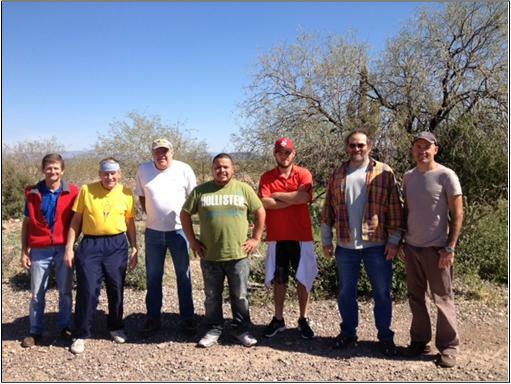 Thanks to 10 volunteers who did their part to maintain AYC’s commitment to the Adopt-a-Highway program. 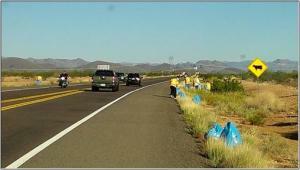 In 2½ hours on a Saturday morning they filled nearly 50 bags with trash along a ¾ mile stretch of SR-74. The day was complemented by beautiful weather, several hot air balloons landing nearby, and a good lunch courtesy of AYC. If you’re interested in helping on a future clean up, please contact organizer Peter Lehrach. The crew (left to right): Martin Lorch, Thom Dickerson, Jeff Sloan, Juan Gagna, Jake Wease, Paul Eyssautier, and Kyle Clark. Volunteers not pictured: Pierce Cunningham, Michael Parker, and Peter Lehrach (who took the picture).